A couple of years ago a YouTube video Postcard from Perth was much circulated round these parts. Filmed in 1954, it showed an idealised vision of a utopian city. How idealised? Just look below the line. Comment after comment from people wishing they lived in the 1950s rather than now. So, how accurately did this film portray the reality of everyday life? On a scale of 0 to 10, we would have to say minus six. Imagine being old, or disabled, or Aboriginal, or a war veteran. What was Perth like in 1954 for these people? The answer is they were to be found living in dwellings constructed of rusting corrugated iron and old bags. These ‘homes’ afforded little protection from the weather. Floors were just sand with chaff bags as mats. Without water or power, none of the houses had bathrooms or sanitation. Improvised wells provided washing and drinking water. 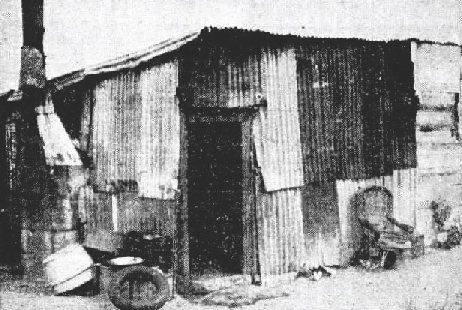 These slum conditions were not in remote communities. One was in Fremantle between South Beach and the Power Station. Known as Poverty Point, the colony of more than fifty was adjacent to a smouldering rubbish tip, a fertiliser factory using fish offal, and an old abattoir. It was strewn throughout with filth and rubbish. Many of the buildings were constructed from flotsam and jetsam, second-hand galvanised-iron, broken bricks, fruit cases, and chaff bags. Fences were bedsteads and curtains were improvised from sugar bags. Another pensioner, Mrs M. Westicott, had lived in the slum for seven years. She and her husband, a war pensioner with a lung complaint, had to make ends meet by salvaging objects washed up the beach. Mrs Westicott had once been known as the ‘Queen of Coogee’, but was now reduced to third-world conditions. Andy Nebro, one of the Aboriginal residents at Poverty Point, was just 22. He was hoping to take his wife out of the shanty town to somewhere more liveable. We hope they made it. So when you look at Postcard from Perth, just remember that there could have been other postcards in 1954. But the government didn’t want you to see those ones. Next Post → They’re heeeere!